A former Little Chef restaurant on a big plot of land, close to Stonehenge, the site now plays host to a number of recognisable brands. Just a mile west of Solstice, this site is located on the A303 eastbound, but immediately after a roundabout and with a link back to it. Inside the services is an odd road layout, offering parking spaces in many different places. It opened in 1989 as the Amesbury branch of Little ChefHistory. 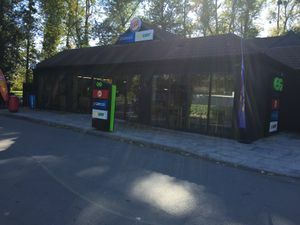 This gained a Burger King with a separate entrance in 1998 and in 2001 its own game arcade. A Harry Ramsden's and Caffe Ritazza were then added as part of Little Chef Choices, with the country's first Coffee Tempo! following in 2006. In 2011, it received a thorough refurbishment as part of the Wonderfully British project, where it gained a Good To Go. The Little Chef closed with the other remaining restaurants to fall under the holding name, EG Diner. 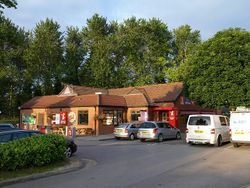 This and the Burger King closed in June 2018 and are due to become a Greggs, Subway and refurbished Burger King. All three were due to open by mid July 2018 but this was delayed until late August 2018. There were plans to include a Starbucks café at the site however this didn't happen. Despite the name Amesbury being well-used, the roundabout and services are officially called Countess. The motel here is very close to Stonehenge and sometimes takes that name.